Quinn Averett of the Mesquite, Nevada police told reporters a search had been executed of the suspected gunman's home and that he believed weapons and perhaps some ammunition had been found. However, he said he could provide no details, saying further information would come from the Las Vegas police. He said the residence was a single-family home on a cul de sac in a relatively new retirement community area. "It's just a regular neighborhood," Averett said. Averett said the female who had been named by Las Vegas police had also lived in the home, but that he was not sure whether others may have live there as well. No one was inside the home at the time of the search, he said. He said the Mesquite Police Department had not had any contact with the suspected gunman or the person with him. "We have not had any traffic stops. We haven't had any law enforcement contacts, no arrests or nothing," Averett said. He called the area a low-crime area. "It's a unique situation," Averett said, adding that there were no active threats in the neighborhood at this time. 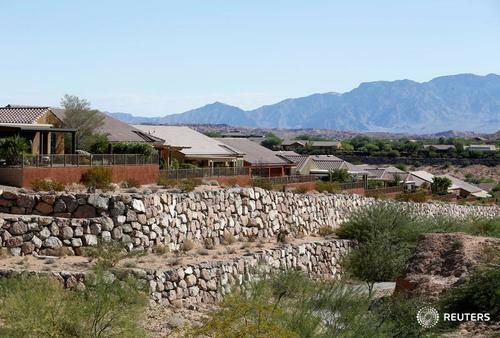 At first glance, it seemed Stephen Paddock, 64, was set for a quiet life in a desert retirement community where he bought a new home in 2015. From there it was only an hour's drive to Las Vegas - where he would embark on the worst mass shooting in recent U.S. history. FBI official says there is no connection with Islamic State: "As this event unfolds we have determined to this point no connection with an international terrorist group." "What we ask for is blood now," the mayor added, urging all those capable to donate blood. "There is not much that we can do, but we can learn." Sheriff Lombardo said the gunman brought the weapons in (the hotel) on his own. "An initial briefing was that we believed he had a female accomplice, but that is not so, we now know," he said. "We believe he had a device similar to a hammer to smash the (hotel) windows," Lombardo said. Lombardo added that investigators will scrutinize "hours and hours" of video recordings at the hotel. Eric Paddock, the shooter’s brother, said the family was “bewildered” as to what drove him to mass murder, saying in a telephone interview the family would release a brief statement through the sheriff’s office in Orlando, Florida, where some of the shooter’s relatives live. 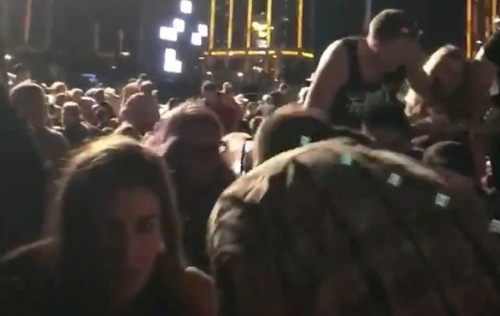 Reaction to the massacre at a Las Vegas country music festival poured in from the United States and abroad on Monday after at least 58 people were killed and more than 500 wounded in the deadliest mass shooting in U.S. history. 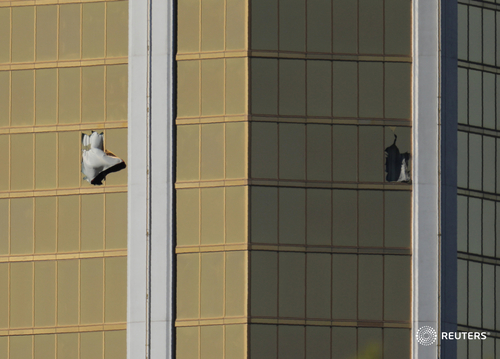 The gunman, Stephen Paddock, had a brother, Eric who described him as a peaceful man who moved back to Nevada from Florida, where gambling is legal, partly because of his fondness for video poker. Their father, Patrick Benjamin Paddock, was a violent bank robber who was on the Federal Bureau of Investigation’s Most Wanted list in the 1960s. 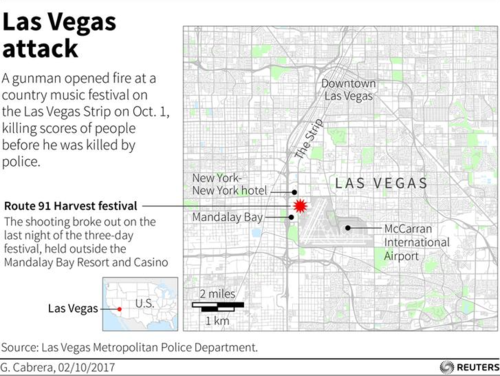 A nurse, a local government employee and an off-duty police officer were among at least 58 people killed by a 64-year-old gunman who opened fire on a Las Vegas country music festival before killing himself in the deadliest U.S. mass shooting. Sonny Melton, 29, of Big Sandy, Tennessee, saved his wife, Heather Melton, just before he was shot dead, she told WSMV-TV in Nashville. "He grabbed me and started running when I felt him get shot in the back," she told the NBC affiliate. "I want everyone to know what a kind-hearted, loving man he was, but at this point, I can barely breathe." Sonny Melton worked as a registered nurse, media reports said. Quinton Robbins, 20, of Henderson, Nevada, studied at the University of Nevada, Las Vegas and worked in local government, Newsweek reported. His aunt, Kilee Wells Sanders, confirmed his death in a Facebook post: "He was the most kind and loving soul. Everyone who met him loved him. His contagious laugh and smile. He was truly an amazing person. He will be missed by so many, he is loved by so many. So many awesome talents. I can't say enough good about this sweet soul." An off-duty Las Vegas police officer was among those killed. "We are sadden (sic) to report that one of the deceased from Sunday night's shooting, was an off-duty #LVMPD police officer," the Las Vegas Metropolitan Police Department said on Twitter on Monday. Officials have not identified the officer. 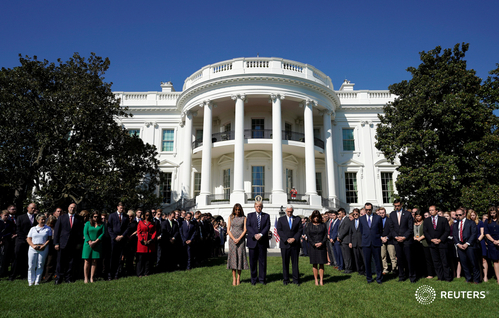 White House says premature to discuss gun control policy before knowing all the facts of the Las Vegas attack. The White House says the issue of bipartisan gun control policy is "something we can talk about in the coming days." They need to look at things that would have actual impact on gun violence, says Press Secretary Sarah Sanders. View of Mandalay Bay Hotel window where gunman Stephen Paddock opened fire on a concert, killing 58 people and wounding more than 500 others. "If you look to Chicago, where you had over 4,000 victims of gun-related crimes last year, they have the strictest gun laws in the country. That certainly hasn't helped there. So, I think we have to -- when that time comes for those conversations to take place -- then I think we need to look at things that may actually have a real impact." Reuters Breakingviews columnist Tom Buerkle writes that, horrific as it is, the events in Las Vegas are unlikely to leave a lasting impact on gun laws, markets, political debate or voters’ minds. Caleb Keeter is a guitarist for the Josh Abbott Band, which performed at the festival on Sunday. A nurse, a local government employee, an off-duty police officer and two Canadians were among at least 58 people killed by a gunman who opened fire on a Las Vegas country music festival before killing himself. Stephen Paddock’s age places him in the minority of mass shooters, who tend to be younger, said Laura Dugan, Professor of Criminology at the University of Maryland. A Washington Post database of 131 events dating back to 1966 in which four or more people were killed by a lone shooter found the vast majority were ages 20 to 49. But there have been high profile cases of older mass shooters, including Kurt Myers, who was 64 in 2013 when he shot people at two different locations in upstate New York; and William Baker, who was 66 when he killed four people at a Chicago-area diesel engine plant in 2001. Reuters reporter Devika Krishna Kumar is at University Medical Center in Las Vegas where volunteers and staff are working to help each other by passing around charging cables for devices and giving out free hugs. Two officials told Reuters reporter Devika Krishna Kumar that they are at the hospital visiting a fellow officer who was off duty but was injured during the shooting as he tried to help people. Las Vegas sheriff says 59 dead, 527 injured after mass shooting at country music festival. He also says 18 additional firearms and explosives were retrieved from house in Mesquite. An official from the University Medical Center in Las Vegas told Reuters that it received 104 patients from the mass shooting. Of those, four died, 12 are in critical condition, 40 were discharged and the remaining patients are in serious condition. As the only Level I Trauma Center in Nevada, the hospital received the most seriously injured people. U.S.When the shooting began, some refused to believe a massacre was underway. A Las Vegas off-duty police officer, a nurse from Tennessee and commercial fisherman from Alaska were among at least 59 people killed by a gunman who opened fire on a Las Vegas country music festival before killing himself. The following describes some of the victims. U.S.Stephen Paddock appeared to be settling into a quiet life a few years ago when the 64-year-old apartment manager and avid gambler bought a home in a quiet Nevada retirement community about an hour's drive from the Las Vegas Strip and his beloved casinos. 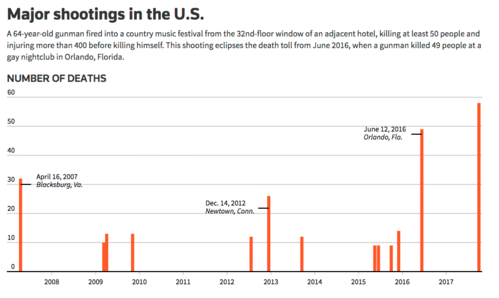 Major shootings in the U.S.
ReutersA 64-year-old gunman fired into a country music festival from the 32nd-floor window of an adjacent hotel, killing at least 58 people and injuring more than 400 before killing himself. This shooting eclipses the death toll from June 2016, when a gunman killed 49 people at a gay nightclub in Orlando, Florida. Reuters TVLas Vegas comes together after the deadliest mass shooting in modern U.S. history that's left at least 59 dead and over 500 injured. U.S.The slot machines were still ringing and the drinks still flowing but the party didn't feel quite the same along the world-famous Las Vegas Strip on Monday evening, 24 hours after a gunman staged the bloodiest shooting in modern U.S. history. Among victims of the shooting rampage being treated at the University Medical Center of Southern Nevada , about a quarter of them were listed as “critical but stable” while most of the others were in “serious but stable” condition, John Fildes, the hospital’s trauma medical director told CNN on Tuesday morning.